Recently, the Asus has launched its gaming smartphone “Rog” in India, which was announced for the very first time at Computex earlier this year. We compared the phone with the iPhone X to see which one provides the best value for your money? The Asus Rog is the world’s first gaming smartphone that comes with a 3D vapor cooling chamber system. The smartphone features a 90Hz refresh rate and a 1ms response time. 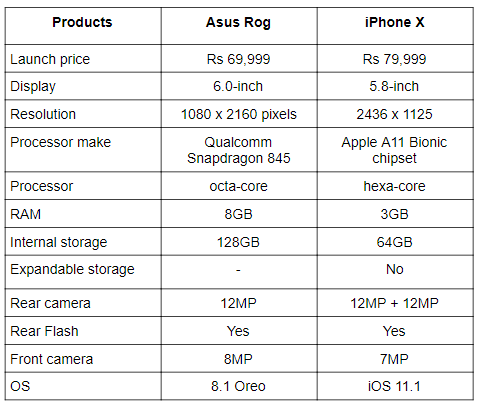 On the other hand, we have the Apple’s iPhone X, which was launched last year at a price tag of Rs 91,900 is now available on Amazon for Rs 79,999. So, let’s compare these two devices to know which one would be the best buy for you? The Asus Rog comes with a 6.0-inch display that offers a resolution of 1080 x 2160 pixels. On the other hand, we have the iPhone X, which sports a 5.8-inch display with a resolution of 2436 x 1125 pixels. When it comes to the performance, the Asus Rog is powered by a Qualcomm Snapdragon 845 processor, while the Apple iPhone X is equipped with an Apple A11 bionic chipset. The Asus Rog come in two variants 8GB/128GB and 8GB/512 GB, while the Apple iPhone X is available in 3GB/64GB and 3GB/256GB variant. As far as the cameras are concerned, the Asus has designed this smartphone strictly for gamers. So, if you’re looking for a smartphone with a dual camera setup then the Asus Rog might not be the device you will prefer. The phone is equipped with a 12MP sensor on the back with an 8MP unit on the front. On the other hand, the Apple iPhone X comes with a dual 12MP rear camera with a 7MP sensor on the front. 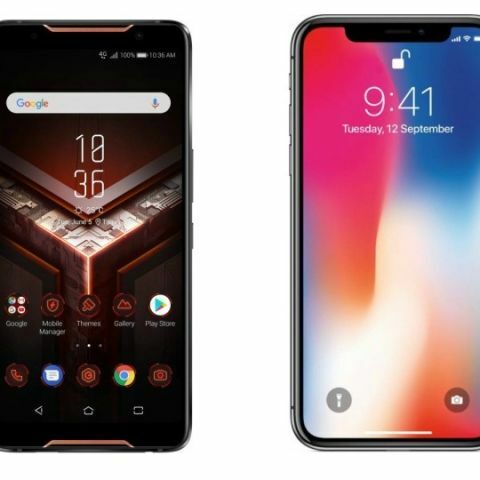 The Asus Rog is available in India at a price of Rs 69,999, while the Apple iPhone X is available on Amazon for Rs 79,999. One plus X vs LeTv Le 1s??? ?